June 13 of this year will mark the 85th anniversary of Franz Kafka's death and, unlike many younger and less renowned writers, his work has not yet been collected in a definitive, dare I say "Deluxe," edition. Samuel Beckett, Kafka's spiritual if not literal Protégé, has been honored with the four volume Grove Centenary Edition of his complete works. Jorge Luis Borges, one of Kafka's many champions, has received three neat volumes by Penguin - one for his complete fictions, retranslated for the occasion, a second for a generous selection from his non-fiction writings, and a third for a selection of 200 poems, translated into English by a variety of writers, translators, and poets, and appearing alongside the original Spanish versions. But Kafka, in spite of his seminal importance, remains uncollected. I admit that there are some issues that would complicate publishing Kafka's complete works. First, much of it is now irretrievably lost, either disintigrated in the folds of time, or destroyed at the hands of people who obeyed Kafka's infamous request to burn all of his unpublished work. A notorious yet unsubstantiated story involves Kafka's lover Dora Diamant burning a completed draft of the unfinished story "The Burrow" ("Der Bau"), along with other works following his death. But even limiting ourselves to what still exists in this realm is problematic since there are certainly some letters Kafka has sent, which are known to still exist, that have not yet been made public. The most publicized case involves a whole stack of previously unseen documents, postcards, sketches, and personal belongings collected by Max Brod, Kafka's literary executor, which have been gathering dust if not mold in the almost certainly humid Tel Aviv apartment of one Esther Hoffe, Brod's former secretary and lover. 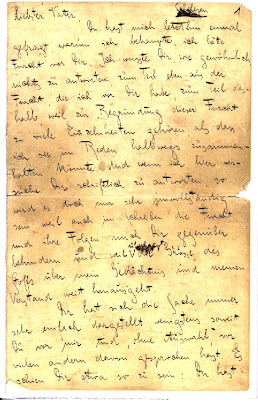 These papers may include the original manuscripts of some of Kafka's famous works of fiction, including according to one estimation, the original manuscript of the unfinished "Wedding Preparations in the Country" ("Hochzeitsvorbereitungen auf dem Lande"). It is still unclear what has become of the papers following Hoffe's death in 2008, but it is assumed that the forty years that have passed since Brod's death have not been kind to them. On the other hand, it may be safe to assume that despite the great value of the original documents, there probably isn't much there that has not already been published by Brod. Kafka's lost papers consist of 35 letters written to Dora Diamant in 1923 and 1924, and up to 20 notebooks, used for journals, sketches, thoughts and ideas, written during the last year of his life. So let's assume, for the time being, that at some point in the future everything that can be discovered will be discovered and made public. Even in this best case scenario, there's still the issue of copyright to deal with. Right now anyone who wants to publish any of Kafka's fiction, from his original and esteemed publisher Schocken Books to the slapdash and deplorable Dover Thrift Editions, can do so without much regard since his fiction has entered the public domain. I assume the copyright for the volumes of letters and diaries, first published between 1952 and 1974, still stands, probably in the hands of The Kafka Estate, or at the very least someone who would not be unwilling to have them republished, and thereby gain some more royalties, but new issues could always come up when it comes to permission and copyright. There are countless stories of literary executors withholding certain documents from scholars or publishers, perhaps most infamous is the case of Stephen Joyce, James Joyce's grandson (as detailed in a New Yorker story), who practically bullies researchers who wish to view his gradfather's papers. More encouragingly, Vladimir Nabokov's son, Dmitri, has finally relented and agreed to publish his father's last, unfinished novel The Original of Laura, after years of stating that he plans to destroy it (The perfectionist Vladimir made it clear that, upon his death, any unfinished work was to be destroyed). Copyright issues have also plagued Penguin's admirable attempt to reissue Proust's In Search of Lost Time in English (the first entirely new English-language version in decades; all previous editions were simply revisions of Moncrieff's 1920's translations), effectively preventing the publication of the last three volumes of the masterpiece in the States. Though the complete novel was published in the UK in 2002, only the first four volumes are available in the US due to 1998's Sonny Bono Copyright Term Extension Act (CTEA), aimed at protecting Disney's Mickey Mouse from becoming public domain, which extended the term of copyright by 20 years. Thus, it will be around 2018 before the final three installments of the new translation will be made available here, unless, of course, Disney get their way and the copyright term is extended even further (see The Slate's "In Pursuit of Proust" for more on this case, and The New Yorker's "Righting Copywrongs" for arguments against the CTEA). Getting back to the topic at hand, one of the reasons I crave this new, definitive edition of Kafka's work is that, though the fictions and diaries are still readily available, Schocken has not published new editions of the letters since 1990, and even then in less than appealing editions. The slim volume Letters to Ottla (Kafka's sister), unpublished since 1987, is particularly hard to find in decent condition. I won't deny that I would very much like to have a nice, neat collection, uniform in height and covers, of everything Kafka has ever comitted to paper. So again, let's assume all issues of copyright and permission have been resolved, perhaps thanks to the scope and ambition of this fictional pet project of mine (let's pretend for a while that I am persuasive and have much charisma, we're assuming so much already). Naturally, as in the case of Penguin's Proust, new translations are in order, if not for the letters and diaries, at least for the fictions. Here we encounter yet another problem, since even among scholars there is little agreement on what a definitive edition of these works would look like. 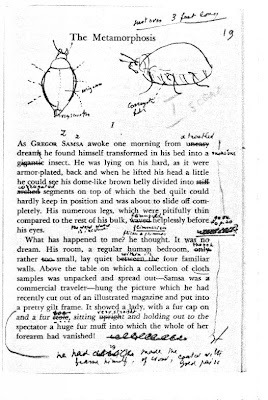 Each one of the three novels has been printed in various versions - rearranging elements, selecting between variant passages, and excising or restoring scenes. This is a problem that often occurs with works that were unpublished in the writer's lifetime and his unknowable intent must be reconstructed by scholars, who each have their own agenda. In the case of Kafka's novels, I think there is more or less consensus that Schocken's new translations based on the restored texts are the best (Breon Mitchell's The Trial and Mark Harman's The Castle and Amerika), but a serious new translation of the short stories is needed. Naturally, the new definitive editions should also include all the fragments and variations that relate to each work. Below you will find my idea for how this definitive edition of Kafka's work can be designed (quite simple yet elegent, I believe) and how it would be broken down into seven volumes, each containing between 450 and 600 pages. (An alternative compilation would be to combine the contents of Kafka's diaries, notebooks, and letters and rearrange them into chronological volumes, as was done, less inclusively, by famed editor Nahum N. Glatzer in the selection of Kafka's autobiographical writings, I Am a Memory Come Alive).